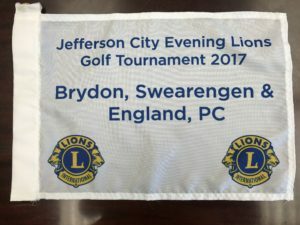 Our firm, Brydon, Swearengen & England P.C., was a hole sponsor for the recent Jefferson City Lions Club 23rd Annual Golf Tournament event held on June 10, 2017. The proceeds of the Jefferson City Evening Lions Club Tournament helps the Jefferson City Evening Lions Club assist a variety of many different important and worthwhile causes in the local community. We were happy to support the Jefferson City Lions Club and their event and look forward to doing so again in the future. Below you can find a picture of the flag that was used in our tournament golf hole.